but last night and this morning were too hectic for writing. 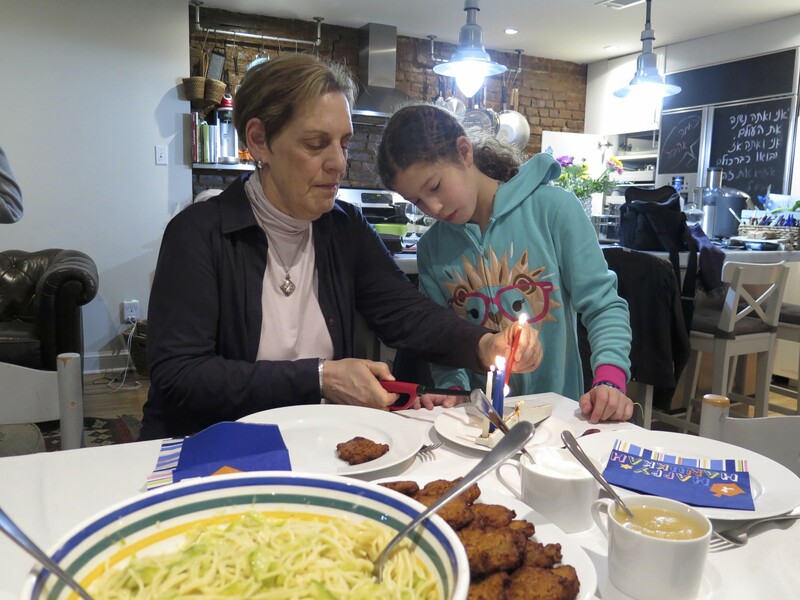 A Rosenberg Family Chanukah celebration back in Hoboken took all of my energy. We lit candles with your menorah and my gifts were a big hit- small magnets for everyone- pictures of each person with you- YAY! Adi cooked the feast complete with great doughnuts that you would have loved. I wondered though, as I sat with the family, about the story for today and as I sift through our 20 years together in images, I’m amazed at the number of trips with took together. One year ago today we were on the beach at Excellence Riviera Cancun, our 2nd favorite place. After all, you can’t beat the customer service at Excellence Playa Mujeres, right? But that last image above this letter triggered dreams last night of walks on beaches with you. Those other images were taken on our first decadent beach trip to Club Med Turks and Caicos. We arrived at a tiny airport in the pouring rain. Remember our luggage dumped in large wooden grates and each one of us had to pick out our pieces so that they could be loaded onto the Club Med vans. They we climbed into a small van with other couples and prayed that the rain drops on the windshield would disappear by the time we arrived at our destination. In the pitch black darkness I moved closer to you, silently grabbing on as we jerked in and out of deep holes. I was doubting myself, my decision to select for a Club Med vacation. But you were poised for adventure. From the moment I stepped out of the van, I didn’t want to ever get back in. We were welcomed and led into the center of the village by the young TMs (?) dressed in white- all white, to set off their deep tans. Each of the new arrivals was offered a light, cool drink and led to a small table to be individually registered. All conversation was soft, whispery, as if they knew we had landed with anxiety. After all they were experienced in making this grand gesture for late night arrivals. We were grateful. Could I refused you that enthusiastic promise of beach romance? And we did… even though we couldn’t see the ocean, we could hear it from our room located just over the scuba diving center. We didn’t even bother to take sandals. Away from the cold and snow of New York in December, we were free at midnight to stroll to the edge of the ocean and dig our toes into the warm sand and dream as we walked together. Soon after you passed I canceled two of our three Cancun trips we had booked for this winter. But the last one, the one scheduled for March, that one I couldn’t refuse. With Jane and Michael for company, we will feel you with us. Early each morning, after just a small glass of orange juice, a few sips of coffee and a slice of toast, I will be out walking in our footsteps, tearing up, feeling you next to me but missing your hand in mine. This entry was posted in Letters to TUvia and tagged #Letterstotuvia97. Bookmark the permalink. Each time I read one of these, I marvel at the lovely detail you are sharing, Bonnie. Your memories take me there too, this time to that midnight walk to the beach, barefooted and sinking into the sand, and into the time and place. What pleasures you gave to each other. Thank you for sharing some of these times, and Happy Hanukkah this evening. I love the pictures, and that current on with the young girl, both of you so intent on your task. Years of memories enhanced by the photos to send you on a journey through time. What a thoughtful gift of the magnet pictures! You inspire me to capture more moments. So many lovely places to pause and enjoy your remembrances.